The Wisdom of Merlin by T.A. Barron -- and a Giveaway! Synopsis (from the publisher): A book of advice from Merlin, the greatest wizard of all time. Based on an address he gave to students at the University of Oxford in 2013, T.A. 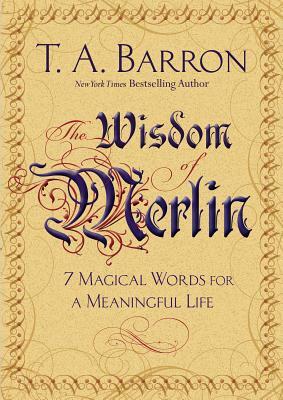 Barron, author of the New York Times bestselling Merlin Saga, channels the wizard Merlin and offers advice on how to live a meaningful life. Divided into sections, each revolving around a magical word, this book poetically explores the concepts of Gratitude, Courage, Knowledge, Belief, Wonder, Generosity, Hope, and an extra one: Love. Why I recommend it: It's beautiful and inspiring and fairly bursting with optimism. Kids and adults would all do well to listen to the sage and up-to-date advice of the ancient wizard Merlin (as presented by T.A. Barron). Even if you've never read T.A. Barron's Merlin series (and why haven't you? ), you'll find much to love here. The short chapters and slim size mean even reluctant readers could handle this. Ah, Merlin would have believed in Screen-Free week! Bonus: This book makes an excellent graduation gift or even a birthday gift for a special someone in your life. Through the generosity of the publisher AND the author (thank you! ), I ended up with two copies of this hardcover. 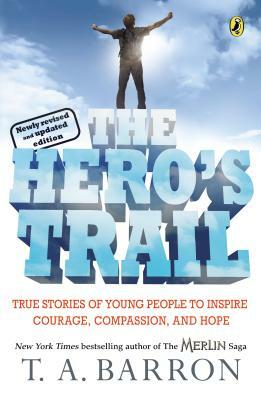 So I'm giving away one of them, along with a paperback of the newly revised and updated The Hero's Trail, another inspirational gem of nonfiction from author and conservationist T.A. Barron. That's right. One lucky winner will win both the hardcover of The Wisdom of Merlin and the paperback of The Hero's Trail. This giveaway is open to anyone age 12 and up. International entries welcome. To enter, you MUST be a follower of this blog and you MUST leave a comment on this post. This giveaway will end at 10 pm EDT on Sunday May 24 and I'll announce the winner on Monday May 25. Children's Book Week is May 4--10, 2015. To celebrate, I'm featuring a book with excellent Newbery potential which is also a wonderful choice if you're looking for diversity. Yes, yes, I know it's also Screen Free Week (you may remember I participated last year and oh gosh, the year before was epic ("mistakes were made"), but now that I have a smart phone, I admit it. I'm hooked. I've decided one or two screen-free days a week is the best I can do. Don't forget to go outside and run around once in a while. Or read a book! How about this one? Synopsis (from the publisher): A California girl born and raised, Mai can't wait to spend her vacation at the beach. Instead, though, she has to travel to Vietnam with her grandmother, who is going back to find out what really happened to her husband during the Vietnam War. Mai's parents think this trip will be a great opportunity for their out-of-touch daughter to learn more about her culture. But to Mai, those are their roots, not her own. Vietnam is hot, smelly, and the last place she wants to be. Besides barely speaking the language, she doesn't know the geography, the local customs, or even her distant relatives. To survive her trip, Mai must find a balance between her two completely different worlds. Why I recommend it: The voice! It's so realistic you'll swear Mai is a real almost-thirteen-year-old girl who lives in your neighborhood or else you're overhearing her talking at the beach. And some of her observations will make you laugh out loud. Meanwhile, her gradual awakening to the world of her roots is deftly handled and almost guaranteed to bring tears to your eyes. Another reason I'm so impressed? Vietnam itself becomes a character in this beautifully written novel. I love it when that happens. 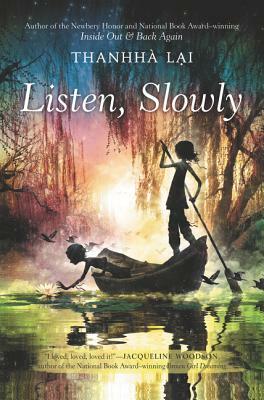 Favorite lines (from p. 89): "You'd think a little village in North Vietnam couldn't help but be tranquil and quiet, full of banana groves and bamboo forests, but everything here has a big mouth. Dogs fighting, crickets blasting, frogs screaming, chickens clucking, birds screeching, mice scurrying..."
Bonus: I learned a great deal about Vietnam.